was built for the performance, reliability, security and scale delivered by Google Compute Engine. Needless to say we are very excited to support the launch and general availability of Google Compute Engine. SaltStack is a systems automation and configuration management framework written in Python and built from the start to be fast, scalable and open while being simple to use yet flexible enough to meet the challenge of any data center automation task. In just two years SaltStack became the eighth biggest and most active open source project on GitHub at the end of 2012, and thousands of the largest infrastructures in the world are already heavily Salted. Autonomic, event-driven compute resources that autoscale to demand or lack thereof. SaltStack can be first used to deploy Google Compute Engine resources and then to provide ongoing management and automation of Compute Engine VMs and configuration management of the application stacks running in that environment. Once you have a Salted GCE environment it is time to utilize SaltStack to deploy and control virtual machines in milliseconds while managing application configurations and doing continuous code integration and deployment. 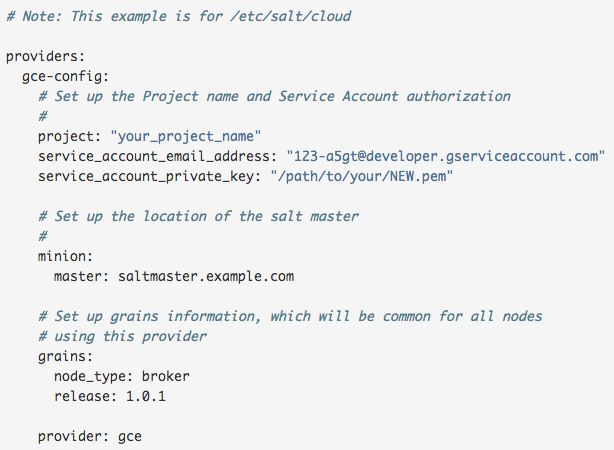 SaltStack users often command and control Google Compute Engine resources alongside other cloud environments and infrastructure. Join us at SaltConf in January to see all of this in action. Google is the epitome of scale, while SaltStack was designed from the start to deliver systems automation for Web scale, cloud and big enterprise IT. So let’s do big things together. SaltStack was built for the performance, reliability, security and scale delivered by Google Compute Engine. Needless to say we are very excited to support the launch and general availability of Google Compute Engine.